Where did the American democratic tradition begin? 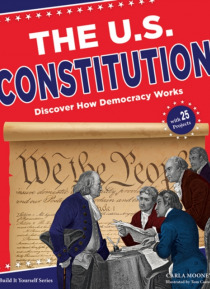 From ancient civilizations in Greece and Rome to the Enlightenment in Europe, democratic ideas throughout time have influenced the development of democracy in the United States.In The U.S. Constitution: Discover How Democracy Works, children ages 9 through 12 learn about the foundation of democracy and how the documents crafted hundreds of years a… go still have an impact on our country today. They explore the Declaration of Independence, U.S. Constitution, and the Bill of Rights, among others. These documents provide a framework with which we make the laws and processes that help keep democracy a vital paradigm.Through hands-on projects, which include analyzing how the promises made in the Preamble of the Constitution were put into practice and investigating how to balance the freedom of speech in the digital age, students investigate how American democracy operates. With colorful illustrations, interesting sidebars, and links to online primary sources, this book asks readers to consider the effect of technology on democracy and make predictions about future documents that will be important to the preservation of democracy around the world.